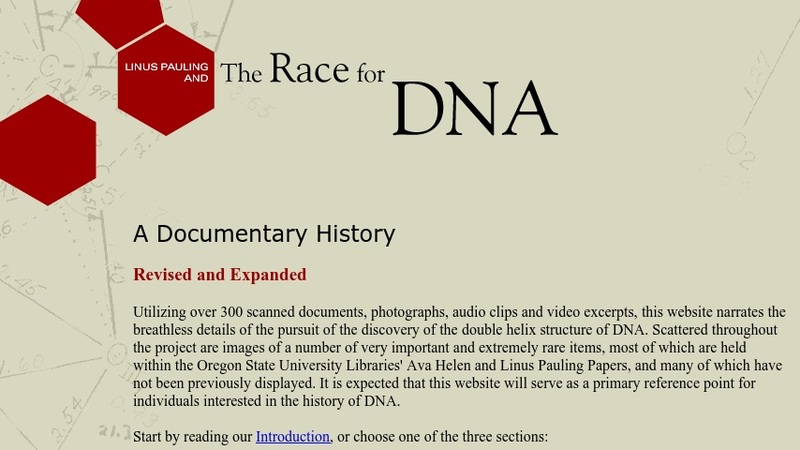 Housed in the archives of Special Collections at Oregon State University's Valley Library, this website narrates the "details of the pursuit of the discovery of the double helix structure of DNA." The story is told through the use of old photographs, video excerpts, audio clips, and more than 800 scanned documents. Linus Pauling (renowned chemist and winner of two Noble Prizes) is the central figure in the website's telling of the DNA story. The site contains three main sections: an illustrated narrative describing the primary actors and events involved in the discovery; a daily account of "Linus Pauling's personal and professional communications and activities for each day of the years 1952 and 1953"; and a collection of documents and other media that includes published papers, manuscripts, and more than 300 letters. The site also provides a Select Bibliography, a Chronological List of Documents, and links to other DNA-related sites.